As we’re approaching the business end of the season, a single match can often have a huge impact on the fortunes of the teams involved so I’ve used the ratings model to identify this weekend’s most pivotal fixtures. This is done by simulating the rest of the season and seeing whose fate changes the most when their match ends in a home win, a draw or an away win. Below I’ve picked out the matches where the most appears to be at stake for both teams, assuming the rest of the season plays out as the model expects. The actual numbers we’ll see after the weekend won’t be exactly the same as the ones shown here as some of the other fixtures being played this weekend won’t go the way the model predicts. Therefore you can think of these as the model’s best estimate of each match’s impact. 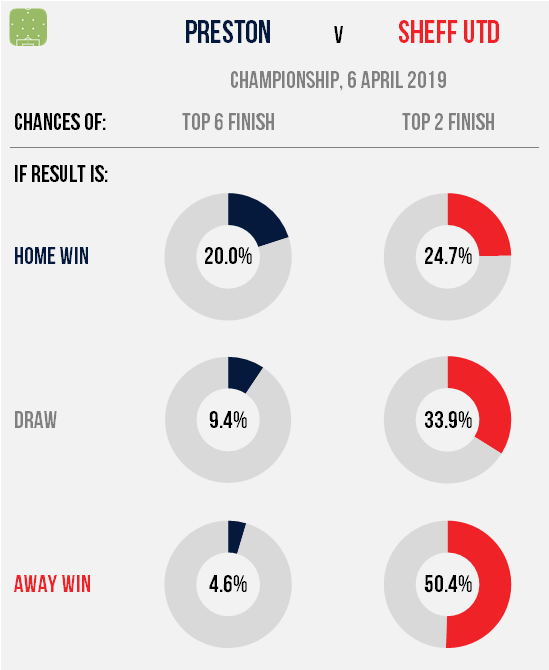 After a dramatic defeat at Wembley last week, Sunderland have an opportunity to put their disappointment behind them by closing the gap on second-placed Barnsley here. If the Black Cats can inflict further misery on Rochdale then they could all but eliminate the Tykes’ edge in the automatic promotion race, although defeat would probably be difficult to recover from. Dale currently sit 23rd but are one of four teams tied on 42 points and have a game in hand, so a win against such tough opposition would actually leave them likelier than not to survive; around twice as likely as a defeat here would. 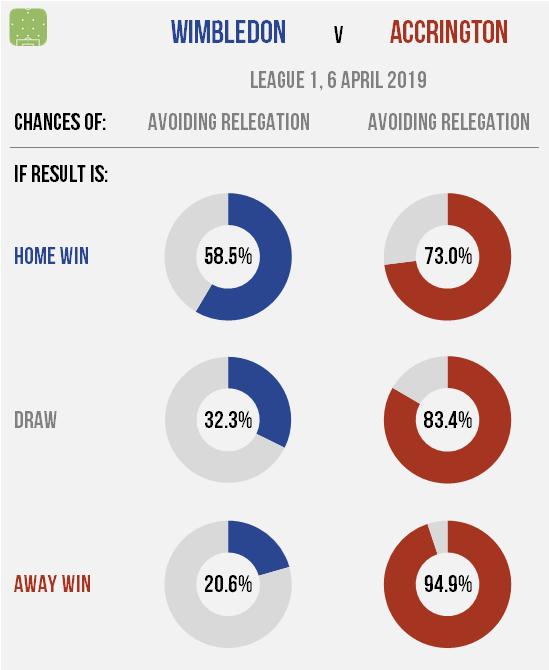 The hosts’ chances of a play-off finish appear to be slipping away in what has been a hotly-contested race this season, but defeating one of the most impressive sides in the division would give them a lifeline. Admittedly, a win here would only boost their hopes to around one in three, but anything less would close the door almost completely. 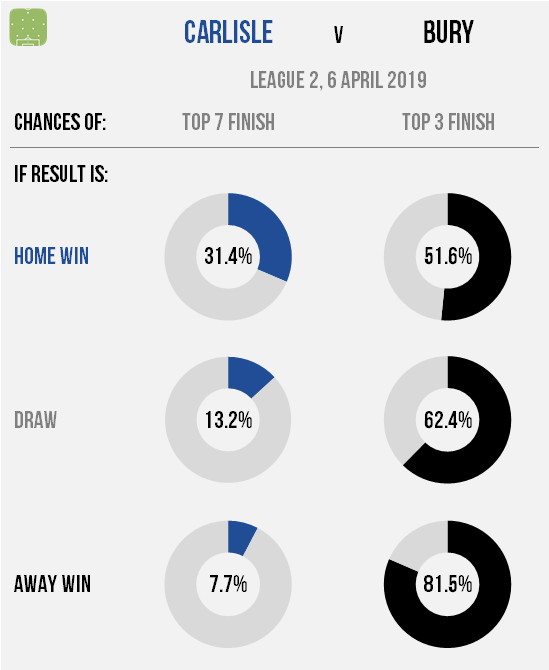 Visitors Bury currently have a two-point cushion in third place and the model would still have them as narrow favourites to remain in the automatic promotion places even if they lose here, but a victory would make it significantly harder for Mansfield or Tranmere to overtake them. This is the second tier equivalent of Carlisle v Bury in League 2: the home side are dangerously close to dropping out of the play-off race altogether and need a win over a higher-ranked opponent to keep their hopes alive. Even a win would probably leave Preston with around a one in five chance of a top six finish, but plenty of teams have gone on to prevail with less. Their visitors have been locked in a dramatic tussle with Leeds for second place: the Blades held the advantage after narrowly defeating Marcelo Bielsa’s side a fortnight ago, only to fall on the wrong side of a 3-2 scoreline last week while their rivals did the opposite. 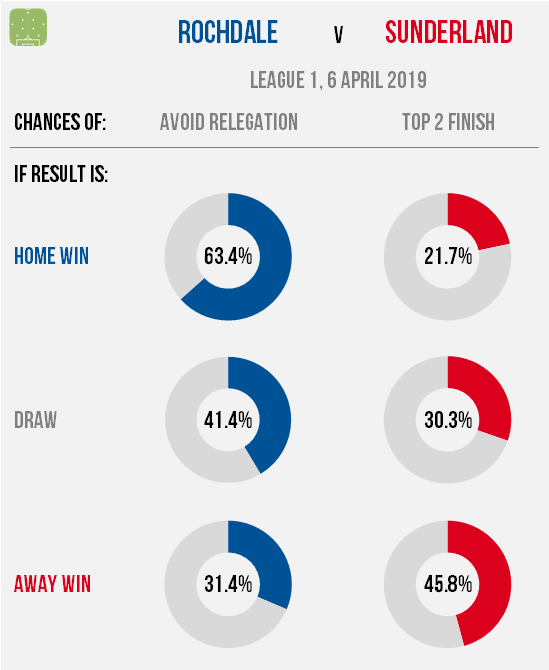 A win here would go a long way towards evening things up again, but defeat could leave them with only a one-in-four chance of avoiding the play-offs. These two sides have drifted gradually closer together in recent weeks as Wimbledon’s surge in form has lifted them off the foot of the table while Accrington have continued to slide after failing to sustain their impressive start. Only two points separate them now, although the visitors have a game in hand, so even defeat here would leave them likelier to survive than their hosts (in the model’s estimation at least). Despite their impressive recent run, anything but a win for the home side would leave them likelier than not to suffer relegation, although there’s still plenty to strive for: taking three points here would make their survival chances almost three times higher than if Stanley were to leave with them.